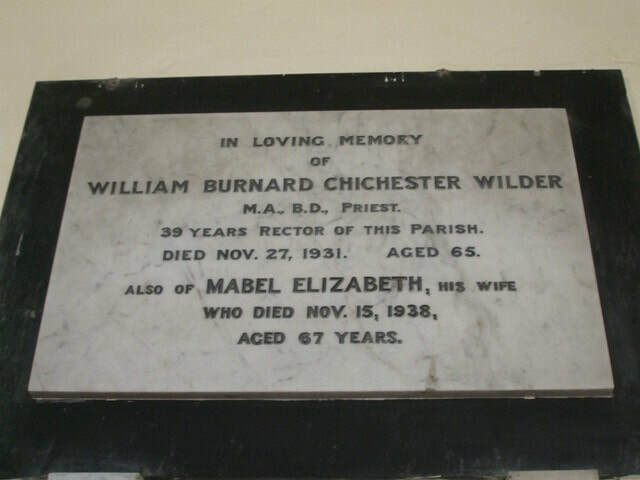 W. Burnard Wilder then records, "The Rev. R. Jackson of Little Thurlow took sole charge of this parish from March 28th 1892 until August 7th 1892", and from this date, Burnard becomes the rector. On 7th May, 1893, he records, "Had no music at the Services, owing to the incompatibility of Miss Beards' temper. She received her notice to quit on May 6th. D..... came over and preached on both occasions. He foams at the mouth 11 " And on 4th June - "The Chapel Anniversary. S. School had only 12 children. It thinned my congregation in the evening." On November 19th of the same year, "A very heavy snowfall, with strong wind. Roads practically impassable. Had only 6 adults in aft." 1.12.1893: A reformation of the Choir was undertaken today, some men having joined. 1. 4.1894: Had Service in the Schoolroom because the Church was undergoing repairs. 1. 29. 1894: On this day the Church was re-opened after having been closed about 3 months. All the Services during this period were held in the Schoolroom. 28. 4.1907:..... generously gave me £1 for erecting church- yard fences. 25. 8. 1907: Chapel had an outdoor service, poorly attended. 15. 9. 1907: Had some insubordination from some Sunday School boys. 22. 9. 1907: During the last month B... and I have been digging up the top end of churchyard, and burning it. Tonight the last of it was burnt. 6.10. 1907: The D... boys caused a lot of trouble today, so that I had to complain to the father after service in the evening. 8.12. 1907: Nasty weather. Chimney smelt owing to its having been re-blackened. 5. 1.1908: Very sharp weather. Ice bears and is good. I went to Branches Park (at Cowlinge) on Saturday and played hockey on the lake. 19. 1. 1908 : Mr. Smith consented to become Rector's Warden. Roads very muddy. Ash Wednesday: Had most of the School children at a children's service at 11 a.m.
Lady Day: Mrs. Smith gave members of Mothers' Union tea at 5 o'clock and afterwards they attended 7.30 service. Nasty wet day. About 6, sat down to tea. 20. 4.1908: 5" of snow fell, but quickly disappeared during the next two days. Again on Thursday, April 23 snow began to fall at 2 o'c and continued. 2. 8. 1908: Beautiful day. Mary Smith happened to be unwell the playing fell on Mrs. Smith, who had no choir. 15.11. 1908: Held Jumble Sale on Saturday the 14th - realised £8/11/-. 20.12. 1908: The Parish roads for the last month have been in disgusting condition. 24. 1.1909: T. . . came, proved ineffective in stables .and garden, but more useful in the house, into which he has been imported. 4. 7. 1909; Had Church thoroughly cleaned. Weeded paths, etc. 26. 9. 1909: During the past week, augmented the choir by the addition of some lads. Sang well this a.m. service. 17. 5.1910: I went to marry Percival [his brother] on 12th May. King Edward VII died at 12 o'c Friday night, May 6th. 20. 5. 1910: Hold a 'Memorial Service' on behalf of King Edward VII at 3 p.m. The greater portion of the Parish attended. Very warm day. Full Church. 27. 5.1910: Mr Long returned thanks this a.m. for recovery from his illness. This Sunday, a new Harmonium was used, raised by gifts and otherwise, the Choir removing from the West End of Church to the seats in the Choir. Rather damp morning. Chapel held its "white frock" anniversary. 17. 7. 1910: Rev. C. Smith preached at 6.30 p.m. I read the prayers. This was relieving to me, after my long cycle ride to Grafham this Saturday. 23.10. 1910: Held a Mission Service in School at 6.30 and at 7.30 - afterwards a service for men only which was attended by 6 or 7 only. The Church Army Van left the Parish on Friday for Boro' Green, after having conducted several Mission Services, sometimes with 'lantern' in the Schoolroom. 27.11 1910 Stove worked unsatisfactorily this day which gave rise to some acrimonious discussion at the hands of those who ought to have known better ! The week Dec. 11-10 was excessively wet. 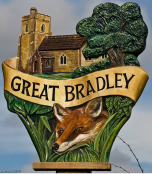 Floods appeared in the Bradleys, Thurlows and Wrattings. 9. 4. 1911: The new Altar Rails and stone steps - a gift from Mrs. G...,were put in position during the week and looked very nice. 25. 4. 1911: Chs. Smith gave a Magic Lantern entertainment in the Schoolroom on the Oberammergau Passion Play. 21. 5. 1911: Mr. Green began putting in new Stone Window in Chancel during the week. Whit Sunday: Dedicated new window at 4 p.m.
18. 6 1911: Began cutting grass on June 16; in the same night, the 4 1/2 weeks' drought broke and rain fell. On Thursday, June 22, King George V Coronation took place. Order of events observed in this Parish was that all the Parish attended a short Coronation Service at the Church and afterwards a public dinner, resorting afterwards to a meadow where a Cricket match took place married and single sports for both sexes. In School, children were given 'Tea' and enjoyed games on Mrs. F.J. Smith's premises. 16.7.1911: No Choir men at a.m. Service. I suppose recovering from Thurlow Poultry Show, which was held on Saturday. 23. 7 1911: Removed organ to West End on Saturday, owing to the weakness, slackness and inefficiency of the choir. Better at West End from all points of view. This morning Mr. F... objected to the harmonium being at West End. 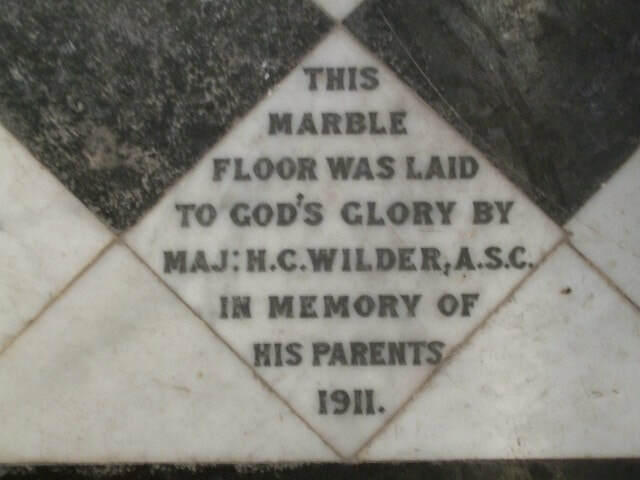 During the week the Marble Floor in the Sanctuary was laid - a gift from Major H. Wilder in memory of his parents. 21. 8. 1911: This morning came to an end one of the driest and hottest summers known for many years - the drought, which had lasted since June 25, broke, and a pleasant rain generally. The Harvest is practically all gathered throughout the country. The rain, however, turned out to be but slight and the drought was again resumed. 23. 9 1911: A slight rain fell on the night of Sept 23. 23.10 to 6.11.1911; Away on holiday. During our absence, the Queen had a stroke and died. Buried the Queen on Nov. 11, 1911. 30.12. 1911: Planted this day 14 young apple trees of various kinds on top back lawn. 31.12. 1911: Went to the Church with Rex and rang the old year out at 11.45 p.m. and the New Year in at 12.01 a.m. "May it be a happy one, both spiritually and materially to all"
29. 2.1912; Social club held a meeting tonight, which was addressed by Major Tippett (Conservative Agent). The beer and baccy proved too strong a temptation to some Churchmen. 10. 3. 1912: A good congregation to whom I preached very indifferently, not being able to deliver the Sermon with fluency and conviction. 19. 5. 1912: My birthday! May I improve in the knowledge and fear of the Lord, as my years lengthen! Prayed again for rain, altho' we had some in answer to last week's petitions. 8.6.1912: A very heavy thunderstorm came on 12 noon. 16. 9 to 20. 9,1912: During the week, "Army Manoeuvres were held in the Eastern Counties. The important battle took place at West Wickham and Horseheath - result indecisive. Entertained several Officers during the week, they camping on Meadows below the Church. 24.11. 1912: E... and. A... forgot where they were and indulged in talking and laughing. On being spoken to, they left the Sacred building. I shall have to see them privately about this. Have seen those two lads and they deny they were behaving improperly. They are without the grace of truth! 16. 2.1913: Mostly men, only 6 women (in the congregation). 30. 2. 1913: Poor congregation - nearly all men. 27. 4. 1913: This being Rogation Sunday, the Carlton Church Band under the leadership of Mr. C. Long arrived at the Rectory at l0.l5 a.m. Processions were then made throughout the Parish, to East Green, Churchyard, Thurlow Road, where short services were held. The morning was windy and inclined to be wet. A Collection was taken at East Green which amounted to 19/8d. The band played Hymns at 6.30 p.m. A great many people were unable to find accommodation in Church owing to the large number. The Collections were handed to the Band to defray expenses, as also those of the Bandmaster, a Mr. Blane of "The Suffolks". The Band was provided with luncheon, very kindly, by Mr. D.K. Long, and tea was partaken of at the Rectory at 5 p.m. 17.'8. 1913 During the last week the pews on N. side had to be taken up to have partially new floors and joists. 11. 1. 1914: Had stove removed to Haverhill on Tuesday Jan. 13 to be relined and recovered (50/-d). Had same back in time for Jan. 18. 9. 8.1914: WAR broke out between Russia, France and England on the one part, and Germany and Austria on the other on Aug. 8 1914. Special intercessory Services used this day on behalf of all engaged in the War. No D...'s at a.m. or p.m. as they had motored into Bury. Will their Motor Car be commandeered for Army use purposes! 11.10. 1914 : I offered up Eucharist with 'special intention' for all engaged in the War, and requested all to stay, although they might not be communicants. This all did - the children as well. 25.10 1914 : A long drought came to an end this week, copious rains falling on several days - it was of more lengthy duration than that which occurred in 1911. 29. 11.1914 : On Monday, November 23. A telegram from War Office announcing the death of my 2nd son. Rex C.P. killed in action Nov. 19 1914, "R.I.P." Held a Memorial Service for the poor old fellow at 3 p.m. on the afternoon of the 29th. Church more than full. Service conducted by Rev. B. Fleming. May, who feels the blow-terribly, still in bed with neuritis, but slightly better today. 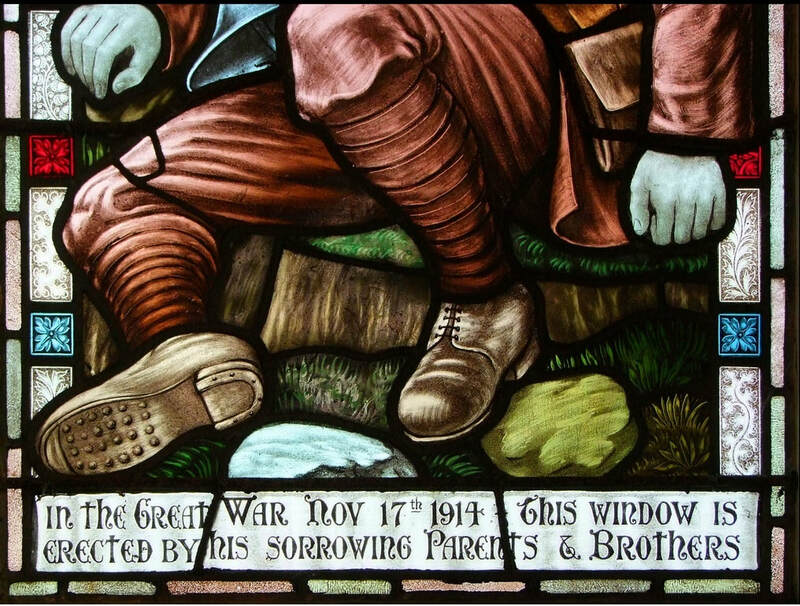 3.1.1915: The year 1914 was a most distressing one to us, from many points of view. About March, May became ill and in July it developed into neuritis. Confined to her bed for many months, under the doctor's hands. She has become somewhat better now. The European war which broke out in August was the cause of our losing Rex, who was killed in action. Thus I may say the year 1914 has proved the worst I ever experienced. May the New Year be of a different stamp! This Sunday has been set apart as a Day of Intercession in all Churches that we, as a Nation, may humble ourselves before God and petition Him to give us victory over our enemies. Special 'Forms' have been provided. Ascension Day: It being wet in the morning, I did not take the schoolchildren to Church. Mrs. MacKean is indisposed with influenza. A Miss Coward from Haverhill takes charge of school. 13.6.1915: Several lads, soldiers also present at a.m.
18. 7. 1915 : 6.30 p.m. Church Parade of V.T. Corps of Newmarket, Saxon Street and Thurlow. Collection amounting to £3/14/6 given to Red Cross Society. I addressed mer ??? and numerous other civilians in meadow opposite "Fox"
22.8.1915 : Boy scouts at a.m.* ditto some soldiers working in harvest here. 28.11. 1915: About 40 children ill with measles. 12.12. 1915 R... was fined £3 at Newark for not having lamps on his haulage engine! 26.12 1915: Leslie [Burnard Wilder's son] in winding up Motor, got struck by handle and broke his arm. 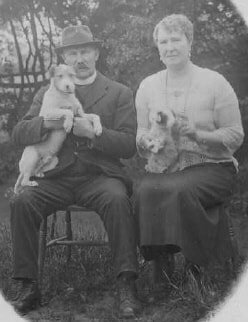 19.2.1916: Mr. Felton, who had an accident - by being kicked By a horse - did not light Church fire. 7. 5.1916: The V.T.C. 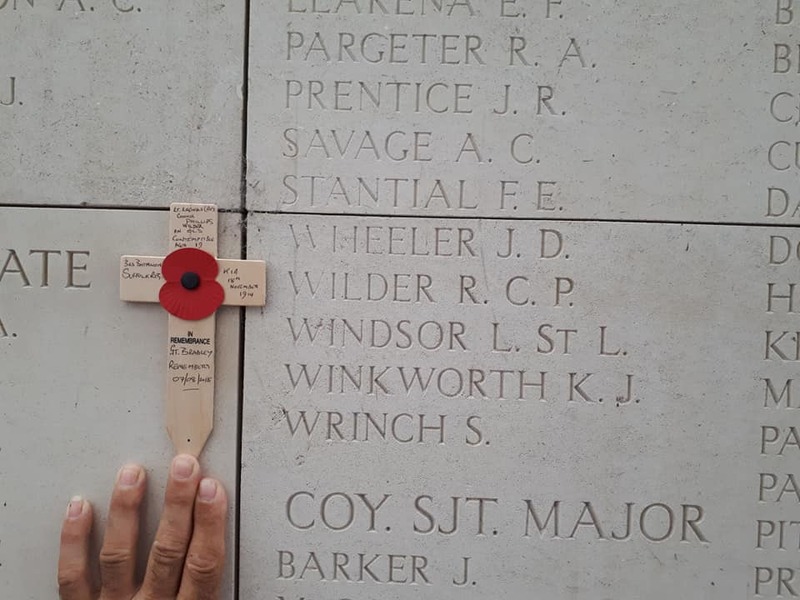 of Thurlow, 29 strong, attended Evensong under Sergeant Campling of Gt. Wratting. Full Church. 21. 5. 1916: On Saturday night all clocks advanced 1 1/2 hours. 3. 8.1916: 6 soldiers and 6 boy scouts at a.m. One soldier communicated. These soldiers and scouts are here for the harvest. Very vet week. Bad for harvest. 17. 9. 1916 : The boy scouts have left the Parish. 1917: The whole of January and February - very cold easterly winds prevailing -with severe frost. 18. 3. 1917: Had a tramp working in garden from March 10 to 17. 15. 4. 1917: Visited Chap. General April 11 in London with the view of obtaining an Army Chaplaincy. Shall know later. Aug. 2 1917. Services in remembrance of Aug. 4 1914, our day of entry into the War. 26. 8. 1917: Very good congregation. 70 present at p.m.
From Sept. 2 1917 to Jan. 13 1918, I was away at Krummel, Flanders in charge of a Church Army Hut under the auspices of Preb. Carlile. During my absence, Services were held once a Sunday by the Revs. Gower, Ramsey, Jones ~ the major portion of the work fell on Mr. Ramsey. I returned to the Parish on Jan. 18 1918 and resumed usual services on Jan. 20 1918. 20. 1. 1918 : Have had report from Mr. Ramsey on the scanty number of Communicants during my absence. This is deplorable. 24. 3. 1918: The month of March has been exceptionally fine and warm. The finest March for many years. 16. 6. 1918: The Rev. Wilson, Headmaster of Ardingly College, here to arrange for school boys coming for Harvest. 4. 8. 1918: Remembrance Day Aug. 4th. In the evening, held a "United Service" on my lawn. 18. 9. 1918 : The Camp broke up on Sat. and left the Parish. 3.11. 1918 Parish down with Influenza. 10.11, 1918: Influenza slightly better in Parish. 17.11. 1918: Thanksgiving Day for Victory over Central Powers. 2. 1918 In afternoon held "Memorial Service" for those who had died in the War, particular mention being made of Parishioners (3). 5. l. 19l9 : The prisoners of War present at a.m.
10. 3.1919: Fire badly laid, therefore went out at 10 a.m.
27. 4.1919: A heavy fall of snow commenced at 2.30 p.m.
6. 7.1919: Collection this day for providing a 'Tea' to all the Children on Thanksgiving Sunday for Peace. Full Church. 18/8d collected. 19. 7.1919: "Peace Thanksgiving" festivities took place today. A cricket match of returned soldiers v. civilians of the Parish began at 11 a.m. Luncheon, given by the Rector, was partaken of by all the returned soldiers at 1 p.m. Cricket match resumed at 3. Tea for all the Children and others on the field at 4.15. Sports for Children at 7 p.m. Weather fine but rain commenced at 9 p.m. Some 40 or 50 people had a 'meat tea' at the Crown Inn. 31. 8.1919: Church closed on Aug. 27 to have new floors and benches etc., School being used temporarily commencing Aug. 31. 1.1.1920: Held a concert on Jan. 16 to raise Funds for "Roll of Honour". Realised £6/16/-. 5. 2. 20: Very fair congregation. More men than women. 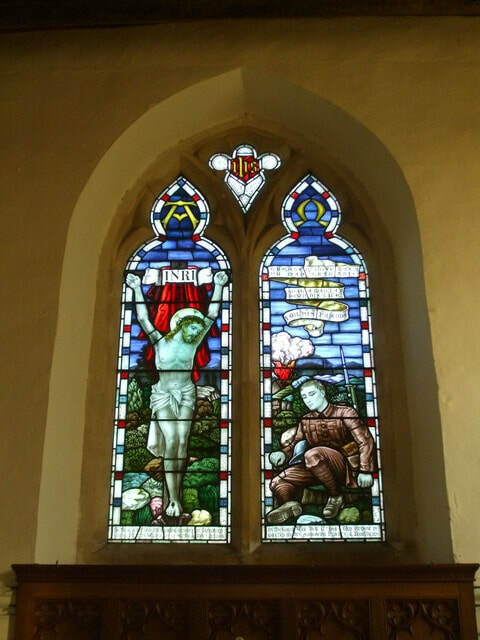 During the week March 21-28 1920, the stained glass East End window and stone work were inserted to the memory of Rex. Following this, on 28th March at Evensong there was a good congregation. After 17th October, 1920, Burnard Wilder records that his Notes are "carried on in new exercise book" but, sadly, this has not come to light. Burnard died in 1931 and a plaque in his memory, along with his brothers is on the north wall of the Chancel.